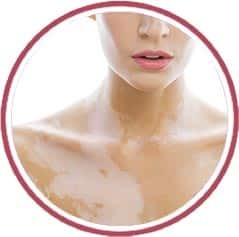 Vitiligo is a skin disorder in which white patches appear on various parts of the body. This is a result of the pigment (color) cells in the skin being destroyed. Excess hair growth in certain areas of the body is known as hirsutism. Hirsutism is a common problem that affects many women. Beautiful eyebrows in women are arch shaped with brow bone showing below the outer eyebrow. In men eyebrows are relatively lower and flatter. Eyebrow, especially its outer end can sag down because of gravity or because of downward muscle pull. This commonly happens with age but can hereditary. When skin dries out, it results in wrinkles. When skin gets dry, the metabolism of skin cells slows down because they need moisture to work properly. Slow metabolism decreases the production of moisture and new cells don’t replace the dead cells as on time. 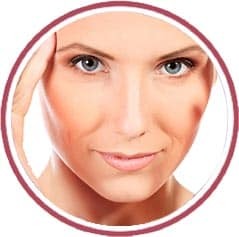 This results in delay in replacing the collagen and elastin (the proteins found in the connective tissues of the skin) that make the skin firm, flexible and strong. As a result, the skin around eyes develops crow’s feet and fine lines first. Droopiness of upper eyelids can be by birth, and that’s called Ptosis. Besides that droopiness and heaviness also happens in normal eyes with ageing. Heaviness feels more in the evenings after a long day’s work. 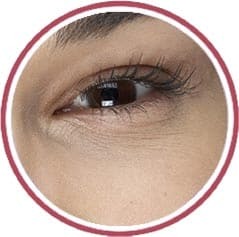 People seek treatment for this because it’s unattractive and makes the person look aged, but also because heaviness interferes with reading and in severe cases restricts field of vision. 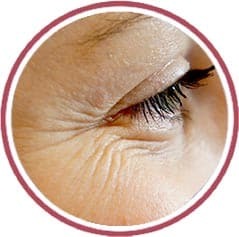 Under eye wrinkles are caused by aging factors which reduce the production of collagen and elastin in the skin. It can also involve genetic, environmental (due to pollution and lifestyle) and hormonal aging in a person.